Too bad so sad Mr. Turkey! It’s almost turkey time! | That's Bad For You! Too bad so sad Mr. Turkey! It’s almost turkey time! Well the time has rolled around again and Thanksgiving is just around the corner. It’s a time to give thanks for all you have and most importantly, a time to have a massive dinner with your family. When you think Thanksgiving, you think turkey, the symbol of the holiday. Mmmmm… You can just see it now! A healthy slice of oven roasted turkey smothered in gravy right next to the dinner rolls and stuffing. As people are in the supermarkets searching for that perfect bird to cook for dinner, they probably don’t think twice about what turkeys will go through to complete their feast this year. 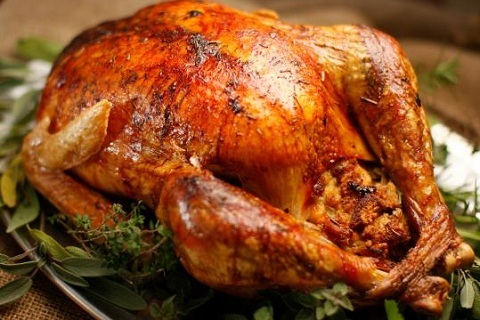 Most turkeys served at Thanksgiving are factory raised. This calls for severe mistreatment and high risk for health risks in humans. I’d hate to spoil the holidays, but I really think everyone should know the truth about turkey before you chow down on it at the dinner table. I’m pretty sure that it will change your perception of “turkey time”. This PETA sponsored video gives a glimpse into what factory turkey farming is like at it’s worst. WARNING: This footage may be very, very disturbing! If you want to learn more about eating wild turkey and farm raised turkey visit the Humane Society’s page on turkeys. If you don’t want to feast on a tortured turkey and are interested in purchasing a farm raised turkey for your Thanksgiving holiday, check labels on turkeys that say this. Try visiting your local farmer’s markets or check local health food stores for more information. Or, just leave turkey off of your plate and enjoy all of those delicious sides! Enjoy your Thanksgiving everyone and don’t forget to give thanks! This entry was posted in Bad For No Reason, Extremely Bad, GMOs, Very Bad and tagged factory raised turkey, farm raised turkey, farmer's market, PETA, Thanksgiving, turkey, turkey time by thatsbad4u. Bookmark the permalink.